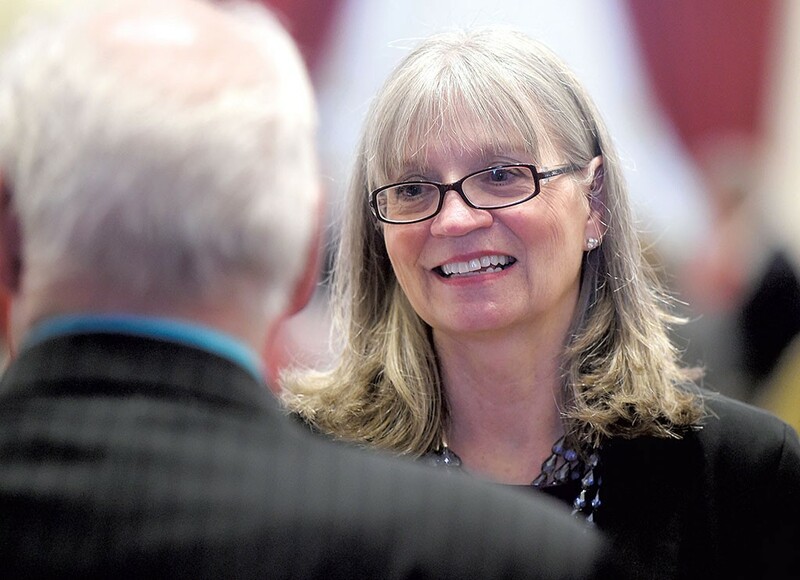 Vermont state Rep. Pattie McCoy (R-Poultney) spent her first term as a lawmaker juggling legislative work with her full-time job as Poultney town clerk. To make sure she didn't short the town, she worked seven days a week, meticulously tracking her clerk hours on a spreadsheet. In the Montpelier quarters she shared with Rep. Barbara Murphy (I-Fairfax), McCoy always had the bigger bedroom so she could set up an office. She brought a portable desk, "and I'd ... go home at night and do my work for the town," McCoy said during an interview in the Statehouse last week. "I owed it to the constituency." When the session ended, she spent 11-hour weekdays and weekend time in the clerk's office to make up the 240 hours she calculated that she still owed the town. McCoy's commitment to showing up and working hard, often behind the scenes, helped her rise quickly through the ranks of House Republicans, first to become their second assistant leader and liaison to the governor's office. In November, the caucus elected the third-term representative as House minority leader to succeed outgoing Rep. Don Turner (R-Milton). In addition to the black leather bag slung over her shoulder and an ever-ready spiral-bound notebook, McCoy brings to the job moderate Republican views, strong organizational skills and a realistic sense of the limits of her party's influence, according to members of her caucus. With their numbers diminished by the November election, Republicans hold just 43 seats in the 150-member House, not enough to defeat a bill or uphold a veto by GOP Gov. Phil Scott. "When [a bill] comes out on the floor, we can all 43 vote against it. Doesn't matter really," McCoy said matter-of-factly. Instead, she said, she wants members of her caucus to focus on influencing legislation as it is being drafted in committees, where most of the legislature's work is done. After watching McCoy work seven-day weeks, Murphy said, she has no doubts about her friend's ability to lead House Republicans. "How she's made it all work isn't just haphazard. That's really what she brings to this role — she's very organized and very committed and very honest," Murphy said. "There's not a lot of, 'This is what I'm saying, but this is what I mean.'" Though she's now the highest-ranking Republican in the House, McCoy, 64, considered herself a Democrat when she moved to Vermont with her husband, Matthew, in the 1980s. They settled in Poultney, where McCoy worked as a paralegal and the couple raised three daughters. She didn't have any political ambitions, but she admired her husband's service in the Vermont Army National Guard — he retired as a brigadier general in 2010 — and became familiar with local government as her work took her to many town offices to check land records. "In 1991, the town clerk in Poultney called me up and said she was retiring; did I want to run for the job?" McCoy recalled. She ran and won, and she later was elected town treasurer, school district treasurer and supervisory union treasurer. McCoy said she hasn't lost an election since she ran for student council in middle school. As she became familiar with the legislature through her clerk work, she began to think about whether she might want to serve there. "It piqued an interest, and I thought maybe someday, someday, someday," she said. "But, you know, someday with three girls and three colleges and master's degrees, and one went on for her doctorate. And two marriages of theirs and four grandkids. It's like, OK," she said, leaning back and throwing her hands up with a chuckle. As McCoy was waiting for "someday," she found her politics trending to the right, in part from getting to know former Republican governor Jim Douglas, with whom she worked during his earlier stints as secretary of state and state treasurer. When her district's representative, Republican Andy Donaghy, retired in 2014, McCoy took the leap and ran unopposed for his seat as a Republican. She won her third term, unopposed, in November. She retired as town clerk in 2017 after serving for 26 years. At the Statehouse, McCoy quickly earned a reputation that closely aligns with the virtues she saw in Douglas: She is viewed as a hard worker and a reliable voice for conservative fiscal policy. During McCoy's second term, then-minority leader Turner recruited her to the caucus leadership team, making her the liaison with Gov. Scott's office. McCoy "did a really good job making sure communication was going both ways, not just one way," Turner said of her relationship with the governor's office. Rep. Rob LaClair (R-Barre Town), McCoy's deputy, said her work as liaison and with individual members of the caucus show that she's a good listener and a skilled communicator, able to find consensus even in the face of political disagreements. "I think Pattie has quiet confidence, and she isn't necessarily one of those that I would say is outwardly gregarious, but she is very, very personable," LaClair said, adding that McCoy is direct without being confrontational. Her deliberate approach — she's more likely to write something down in her spiral notebook while someone's speaking than to jump in with her own idea — shouldn't be confused with a lack of convictions. She split with the governor last year, voting against universal background checks for gun sales and a ban on high-capacity magazines and bump stocks. But like Scott, McCoy strongly stressed the importance of holding down taxes and avoiding policies that make Vermont less affordable for workers and their families. Last year, for example, she opposed proposals for mandatory paid family leave and a $15 minimum wage. Fiscal policy aside, McCoy describes her political identity in terms that distance her from the politics of Washington, D.C. She said she aligns with Scott in opposing the policies of President Donald Trump. "There is such a thing as a Vermont Republican," she said. "I think you saw it in Jim Douglas. I think you saw it in Gov. Snelling ... [It] might be called a more moderate Republican." Though McCoy spends much of her time voicing opposition to Democratic proposals, she's respected by House Speaker Mitzi Johnson (D-South Hero). "In the bit of time that I've known her, she's been a straight shooter," said Johnson, who consulted regularly with McCoy as she prepared to assign legislators to committees. Former Republican minority leader Patti Komline, who now runs her own lobbying firm, said McCoy's success as the leader of a super-minority comes down to playing nice. "It's about your relationship building, working respectfully," Komline said, adding that she thinks McCoy exemplifies those qualities. And there's another role she said McCoy is suited for as the leader of a minority party. Part of the job is as simple as "keeping the morale up for people that are losing on a lot of things." One tactic McCoy uses to encourage her charges may seem counterintuitive for a partisan leader. "We never tell anybody how to vote. We never push," she said of her leadership team. Pressuring fellow legislators to vote with her on every single issue would be out of keeping with the leadership style McCoy has displayed in her first days as head of the caucus. Last Friday morning, she stood with fellow Republican leaders and kicked off a Statehouse press conference commending the governor's budget speech the previous day. McCoy's mild demeanor and slow cadence lacked the made-for-TV exuberance that her more experienced colleagues delivered for the cameras, but she drew attention to her caucus in more subtle ways. When a reporter asked a question about education policy, Sen. Randy Brock (R-Franklin) prepared to answer. But McCoy leaned forward, tapped him on the arm and gestured to Rep. Scott Beck (R-St. Johnsbury). Brock deferred to Beck, who sat on the House Education Committee last year and had worked on related legislation. In her first two caucus meetings as leader, McCoy spoke very little. She opened the meetings and called on members to give updates from their committees but didn't spend any time on pep talks or lectures. "She seemed very laid-back," Murphy, McCoy's legislative roommate, said of the meetings. Laid-back, perhaps — but not inattentive or lacking confidence. At a caucus meeting last week, a visitor interrupted to ask a question. McCoy, who'd been quietly observing from the middle of the room, sprang to attention. "No," she said. "You can't speak." Murphy, an independent who attends both Democratic and Republican caucus meetings, wasn't surprised. She said McCoy is very serious about rules, but not just for the sake of being a stickler. McCoy goes by the book, Murphy said, so that everyone — the public and her colleagues in the Statehouse — know what they can expect from her and from her role in the legislative process. In caucus meetings, McCoy pushes members to stay active in committee work — even on bills they oppose. "I'm successful if the 43 of us go into [our committees] each and every day and work hard on a bill that they may disagree with," she said. Her members can, perhaps, win changes in the parts of a bill with which they most disagree "so that they've made, as we say, a bad bill better." On January 23, McCoy spent her morning leading by example. She sat in the House Transportation Committee, listening and asking questions during a walk-through of the operations of the Department of Motor Vehicles. She was there, she said, for the same reason she once worked seven days a week at two jobs. "Plain and simple, my constituency elected me to come up here and work hard in whatever committee I'd been chosen to sit on," McCoy said. "They haven't elected me to be the minority leader of the House of Representatives for the State of Vermont."